6 in / 6 out USB 2.0 interface with two Mic/Instrument preamplifiers & class-leading conversion 192kHz. Easy to use product. Compatible with everything i use. Bought the refurbished version. The contained red USB-cable was not working and caused occasional "device not found" errors and noise on the headphones, when I connected the interface to my PC the first time. But after exchange with another quality cable I had at hand, everything worked absolutely flawless! Great audio interface and a perfect replacement for my old tascam interface that cannot be used with windows 10! Sweet little compact portable external sound card. I have a 18i20, but this 6i6 is nice to toss in a gig bag to go. Got this product refurbished. It is in excellent condition, works perfectly, and is an excellent piece of equipment. A great addition to my setup! Does exactly what I need it to do, I upgraded from a Saffire 6 USB Sound card, and the sound quality is a lot clearer now through my DAW. Great price, and the option to buy B stock is great if you want to save some cash too. Great! Easy to install and worked well with my Mac! Now I can record my creative stuff in my home studio. Intuitive product and a great way to get right into home recording! This is a really good piece of gear. Easy to use, easy to understand, reliable and sounds great. I'm sold. As much as the product as the brand I had been recommended, once I put the product to the test, I had no doubts about its performance. I haven't used it very long, but from what I have seen/heard from it, it really does it's job well. Bit of trouble getting the device setup, "No hardware found" in the Focusrite Control software. I installed an older version of the software and am having no problems now. Have not had a chance to really test this out to it's fullest potential but so far so good, doing it's job as intended. Great product and great price. Awesome interface. I wish the INSTR input was a little hotter (particularly since there is a PAD on this one)..coming from the Scarlett 2i2 to this, my dry guitar recordings are VERY different in level which, I mean, is pretty easily fixable, but kind of a pain. Regardless, software works great, mix control is way better than the previous generation's program, and the interface's preamps are really solid. Can't beat this thing for the price. Working great, the outside look is also gorgeous, I'll be proud to expose it. 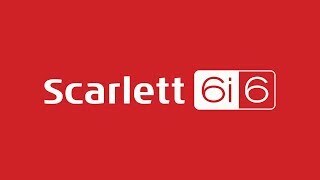 The Scarlett 6i6 2nd Gen is the wind beneath my wings. Just terrific. Works perfectly. Great additional software included. Highly Recommend. Perfect solution for my workstation at my studio. Amazing service , delivered the next day! Beauftul product not only to use but also very slick to look at. Very easy explanation of installation etc..
Mic pres are very good and sounds natural. The routing software is handy.and usefull but I wish if it comes with dsp effects. The built quality is quite sturdy. Very low latency and 2 seperate headphone output is a nice featire. The interface is just amazing! i only have one problem, the software on windows it's not good enough, i installed it twice cause the first one didn't work. Nice looks and good quality. Maybe not the warmest sound in the world but at this price its amazing! Cheap price, fast shipping, and yhe product works great! Perfect hardware for my home studio. Affordable and reliable. The mic pre-amps sound great for the price, control knobs rotate with satisfying precision, and the overall build quality makes this feel like a solid device. My main complaint with the hardware is probably the length of the cord on the power supply (it's a bit short for my needs), but that can be remedied with a third-party solution. On the other hand, the Focusrite Control software has given me plenty of grief (No Hardware Connected error despite Windows recognizing it without an issue), and I'm currently working with support to figure out a solution. Needless to say, this great piece of hardware is nearly useless without the software to configure it. Subtracting 2 stars for its fickleness and unpleasant user experience out of the gate. This product is a perfect replacement for my Mbox2 which unfortunately lost its support by digidesign. Works perfectly with Pro Tools. A fantastic bit of kit. Works straight out of the box, with the Macs, the iPads and the mics. Superb sound, in a powerful package. Highly recommended. Fantastic piece of kit for the home producer / if you have a home studio. Enables great quality sound recording and its slick design looks great. I purchased the second gen 6i6 as an upgrade from a first generation 2i2. I do voiceover work for corporate marketing and training materials and need the mobility of a USB interface because I end up recording at different locations. The quality of these Focusrite USB interfaces is fantastic. I mostly record in Logic Pro X and it just works. I've used a handful of mics with the 6i6, from a Blue Yeti Pro to a Neumann U87, with great results. Nice, functional, and beautifully designed. Worth the money. Two combination inputs with Scarlett mic preamps, line level inputs and high headroom instrument inputs let you record any combination of instruments or vocals. Connect your synths, keyboards or mixers into two additional line inputs on the rear panel, and connect any equipment with digital I/O to the SPDIF inputs to record six simultaneous channels at once. Two headphone outputs let you send individual headphone mixes to two artists, or an engineer and artist, while four balanced jack outputs let you connect to both studio monitors and outboard gear. With MIDI In and Out, you can also integrate your favourite hardware synths with your DAW. The second generation Scarlett range is packed full of upgrades. New super-low latency* will bring confidence to your performance, letting you record and monitor with software effects in real time. New metal gain controls and a sleeker red metal chassis reassure you of its improved industrial design, built to go anywhere. The Scarlett range also now operates at sample rates all the way up to 192kHz, and the input channels have evolved too. The latest Scarlett mic preamp features a more even gain structure, so you can accurately set your levels, and the instrument input has also been completely redesigned so it can handle seriously hot guitar pick-ups. Finally, Focusrite have provided analogue protection circuitry across both the inputs and the outputs, to guard your interface against unwanted power surges. Scarlett 6i6 is compact and tough enough to take to your live shows for onstage recording or playback. The included 'Focusrite Control' is a brand new software mixer for easy configuration of monitoring and routing setups. Simple and intuitive to use, Focusrite Control offers a traditional mixer workflow and allows immediate access to internal hardware functions. Also included is the software and effects you need; an exclusive version of Pro Tools | First Focusrite Creative Pack (featuring 12 additional plug-ins including the Eleven Lite for real life guitar amp emulations), Ableton Live Lite, the Softube Time and Tone Bundle, Focusrite's Red Plug-In Suite, 2GB of Loopmasters samples and more.